After completing chiropractic college together, Drs. 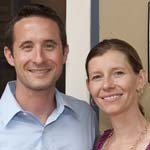 Neal and Nicole Barry returned to Santa Barbara and established Barry Family Chiropractic in March 2005. Both avid runners, they could empathize with and understand the aches and pains of athletes. WEV’s SET program helped the couple augment their chiropractic expertise by demystifying the operation of a business. The phrases “cash flow” and “Profit and Loss” now come just as easily as “adjustments” and “subluxation.” Drs. Neal and Nicole cherish helping athletes and families achieve stronger bodies and lead improved, pain-free lives.